Faraway Press: The Online Home of John Jackson Miller: Lost Tribe of the Sith #4 Now Online! Lost Tribe of the Sith #4 Now Online! Double-dealing and triple-dealing! 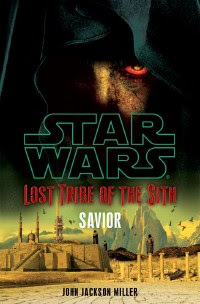 Star Wars: Lost Tribe of the Sith #4: Savior is online now for free download at StarWars.com. This is a fun one — all of the threads from the crash-landing of Omen come together, closing out the first half of this history of the Lost Tribe on Kesh. You can find the simple PDF at the official site — and you can get the Kindle download from Amazon here. You can get the Sony ereader file here — and the Barnes & Noble version here. All sorts of digital choices! The download also includes a preview of the fifth Fate of the Jedi novel, Allies , by Christie Golden. Enjoy — and drop me a line. My apologies for the silence here lately —I realize I'm quite behind on my production notes, as well as posting anything from C2E2 in Chicago. I came right back here from the con to delve into Knight Errant. I'll get everything updated soon. It's been a busy spring! Mass Effect: Redemption #4 -- the conclusion!